It’s money making season and in less than a week I’m going to be launching my New Money Blog Challenge. Yes, after a long summer slump, my spark is back and it’s time for me to show you how to bring home the bacon with your blog. 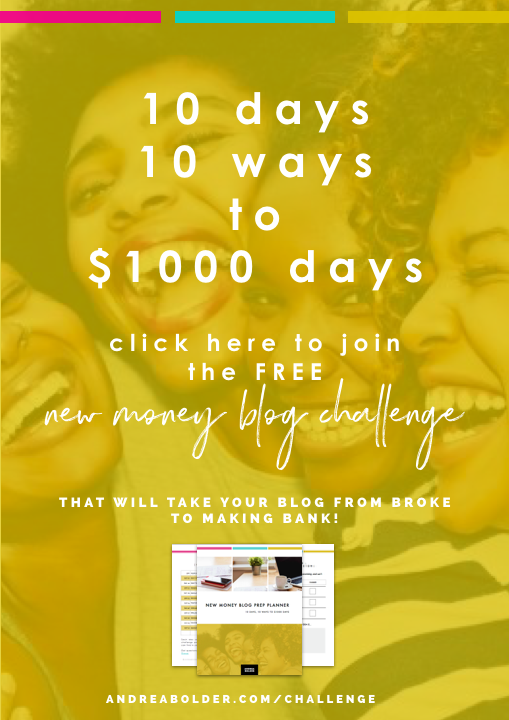 It’s 10 days, 10 ways, to $1K days! And it’s going to be you, me and we, ‘werking’ on simple, yet effective strategies to get your blog in full money making mode. Hundreds of bloggers, entrepreneurs, and influencers from all over the world will be taking part in this 10-day experience hosted by yours truly. It is allllll about the money honey and I can’t wait for us to upgrade your bank account together! WHAT DOES IT TAKE TO BUILD A MONEY MAKING BLOG? When I first started building my blog, all I knew was that I wanted to make lots and lots of money. I saw other people doing it and as with everything I pursue, there was no doubt in my mind that I could make it happen too. Well fast forward a few years later and I was still struggling to make consistent coin with my blog. Yes, this confident, know-it-all had finally met her match. Not all passion is created equal and just because you are passionate about something doesn’t mean it’s a smart business idea. Now that doesn’t mean you should kick your passion to the curb, but if building a wildly successful business is your goal, you also need to solve a very specific problem or satisfy a need and you need to find enough people who are willing and capable of buying that solution from you! Building a business is not easy, but what makes it hard, is not knowing how to sell and attract money. Every year I’d set these huge money goals knowing deep down in my heart that I was never going to reach them because I was too afraid to “go get the money”. Selling is hard, asking for the sale can be hard, I mean who wants to come off as the sleazy, pushy, over aggressive salesperson? No one does. I know I didn’t and I’m sure that’s not the type of reputation you want to build for yourself either. But here’s the truth. When you come to the realization that you deserve to have money, that you work super hard and should be properly compensated for your awesomeness – then you begin to run your business from the perspective that you are the hero and not the villain. You are not trying to force people to part with their money, you are providing value and helping them to connect to the things that will make their lives better. When you get your mind right, your money gets right too. Can’t wait to share the moneymaker mindset tips that have totally transformed my biz + bank account! On the surface, my blog is no different from any other blog that talks about making money online. Think about how many THOUSANDS of online blogs do the exact same thing. But what separates me from every other business on this planet is how I create those products, how I package those products, the vision behind what I create, the voice in which I teach and visual style in how I share information. It’s about the stories behind who I am, why I do what I do and what’s led me to the place I am now. The way I am able to communicate my expertise is unique and exclusive to me. No one else can deliver my ideas in the way I can deliver my ideas. No one else can sell my products with the same passion and spirit I sell them with. And your blog should clearly highlight what makes you different too, so you can ultimately attract and connect with the right people, your “money tribe”. I see this a lot. People chasing money using income streams or business models that do not fully support their big money goals. If you want to make 6 figures with your blog, you can’t sell $10 ebooks. (Well you can, but that’s not all you should be selling!) Do you know how many people you have to convert? A gazillion. But what if you added new income streams, automated income streams, recurring income streams or even higher ticket income streams to your blog, then hitting your money goals becomes that much more doable! Once I figured out which products supported my money goals, I could set meaningful and realistic blog goals that helped propel my business forward. In the challenge I share with you my favorite money making income streams and how to price them the right way. While I had a lot of amazing content on my site (that I spend hours and hours putting together), my blog was leaking potential customers like a two dollar hose. My products weren’t positioned properly, I wasn’t leveraging my opt ins and lead pages in the right way and while I was able to attract visitors with my content, I was losing when it came to building my email list and blog community because I was not clearly articulating the value I was offering. To make money with your blog you have to make it easy (and I mean super easy) for your visitors to find what they need, so they can give you what you want. You have to see your blog from the perspective of your visitors and what needs to happen in order for them to take the specific actions needed so that you (and them) can achieve their desired result. It takes people to prosper in business. And that goes for any business in any niche. If you don’t have the attention of the people, there is no way you can make a profit. There are tons of different ways to drive people to your blog but for the sake of keeping my sanity, I created a traffic generation plan that focused on 3 (not 10, not 12, not 20) effective ways to drive traffic to my blog. As entrepreneurs, we are busy and we can’t be effective if we’re are all over the place. We don’t have all day (at least I don’t) to be on every single platform or social media network. So I chose the focus on promoting in places that gave me the best opportunity to get in from of my perfect fit fan. Traffic is crucial and I can’t wait to share with you the traffic generating, list building strategies I use on a daily basis to drive 50+ subscribers to my email list each and every day. Systems equal success! And don’t let anyone tell you differently. When you are building a business, your focus can be in any number of places at any given time, but when you set up systems that allow you to sell your products on autopilot, the system does the heavy lifting for you, taking your customers from free to paid without you having to lift a finger! So there you have it. After years of trial and error, the new money plan that allowed me to take my blog from broke to a money making machine. And this my friend is why I want to invite you to join me for my “New Money Blog Challenge” where I’ll be breaking down my step by step formula that has completely transformed my business and life. Click here to join me and hundreds of entrepreneurs, bloggers and online brand builders for this FREE challenge! I hope you sign up to join us, you have nothing to lose, but lots and lots of money to make! WILL YOU BE JOINING US FOR THE CHALLENGE? I’D LOVE TO HEAR FROM YOU. SOUND OFF IN THE COMMENTS! These are great tips. I need to work on 2 and 5. I feel as though I am not capturing and converting customers. Yes! I love this! You HAVE to get in the mindset of “ok, this is a business, I’m going to be serious about this!” If you’re blogging for fun, that’s one thing, but if you want to make money at it, you definitely have to take it seriously. Thanks for sharing, I’m pinning this! I’m super excited about this! You know that I’m all about seeing what tools and strategies other people use to help them reach their goals! I’m so in on this one! Thank you so much for sharing this with us! I’ll see you in the challenge!